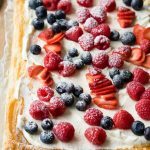 If you have been looking for July Fourth Breakfast Ideas, don't miss this delicious Puff Pastry Breakfast Tart with Whipped Greek Yogurt and Berries. This easy red, white and blue breakfast recipe is a festive 4th of July breakfast. It is fun to make and an easy Fourth of July recipe for kids. Preheat the oven to 425°F / 220°C, or follow the cooking directions provided with your puff pastry sheet. Unroll the puff pastry sheet onto the baking pan. Using a knife, lightly score around the puff pastry sheet, about 1/2-inch from the edge. Be careful not to cut all the way through. Using a fork, prick holes all over the entire surface of the puff pastry sheet, within the scored lines. Using a silicone brush, lightly brush a very thin layer of beaten egg across the entire surface of the puff pastry sheet, including and especially around the border. You will only use up a little bit of the egg. Bake for about 15 minutes, or according to the directions provided with your puff pastry sheet, until the puff pastry is golden brown. Remove from oven and allow to cool. In the meantime, pour the double cream into a medium bowl and add the sugar. Beat on medium speed until medium to stiff peaks form. Fold in the Greek yogurt. Once the puff pastry base is cooled, spread the whipped Greek yogurt mixture on top, avoiding the 1/2-inch along the four edges. Add on the berries. Top with powdered sugar. Cut into portions and serve immediately. See recipe post if you want to add chocolate to the base. The Whipped Greek Yogurt is inspired by Sweet & Savory by Shinee. Get this recipe for Red, White and Blue Breakfast - Puff Pastry Breakfast Tart at https://www.theworktop.com/breakfast-brunch-recipes/red-white-blue-breakfast-puff-pastry-tart/.